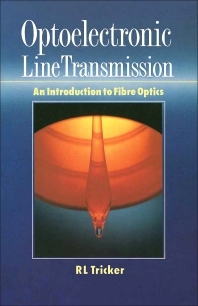 Optoelectronic Line Transmission: An Introduction to Fibre Optics presents a basic introduction as well as a background reference manual on fiber optic transmission. The book discusses the basic principles of optical line transmission; the advantages and disadvantages of optical fibers and optoelectronic signalling; the practical applications of optoelectronics; and the future of optoelectronics. The text also describes the theories of optical line transmission; fibers and cables for optical transmission; transmitters including light-emitting diodes and lasers; and receivers including photodiodes. The use of waveguides, couplers, connectors and repeaters in optical line transmission; the role of optical fibers in communication systems; and optoelectronic test techniques are also considered. The book concludes by discussing the trends and the future of optoelectronic line transmission and the increased use of microelectronics in the industry and military. Practising electronic and telecommunications engineers, technicians and readers and students of communications technology will find the book invaluable.